Nectar mattresses are well-known for their extensive risk-free trials, but that’s not the only thing that sets them apart. Their mattresses use CertiPUR-US materials, plenty of comfort features, and come with a Forever Warranty to protect consumers’ investment (and their sleep quality). Our Nectar mattress review elaborates on the pros and cons and just what makes the Nectar mattress so great. Highlights of this mattress include medical-grade foam for support and comfort, highly breathable materials for cool sleep, and premium components like quilted gel layers and a high-density, highly breathable base layer. 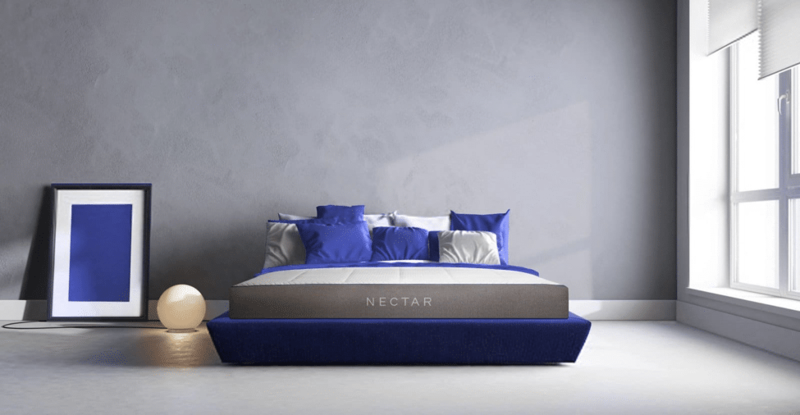 The Nectar bed aims to accommodate a range of sleep styles and needs in one responsive, bouncy, and affordable bed that has one of the most impressive sleep trial lengths in the industry. What is a Nectar Mattress? According to the company itself, sleeping on a Nectar Sleep mattress is like resting on a cloud. From the plush top to the inner cooling components, they guarantee "the best sleep of your life." And while it sounds like a lofty claim, each Nectar mattresses features the highest quality (and most comfortable) materials, so giving it a try might be the best decision you’ll ever make. Nectar mattress reviews on the company’s website highlight the fact that consumers have nothing to lose with the return policy. Plus, many people also note how back and other pain subsided once they began sleeping on their Nectar beds. That’s not exactly surprising given the company’s use of medical-grade memory foam. Of course, Nectar has also had plenty of experience perfecting the ideal mattress, which is why the Nectar mattress is one of our favorite mattresses. They use premium materials from manufacturers all over the world, ensuring that only the best goes into each bed. The factories use strict production protocols and check for quality at each stage in the manufacturing process. And finally, each mattress receives a detailed and thorough inspection before it leaves the production facility. Clearly, Nectar’s confidence in their mattresses is warranted! Plus, they don’t stop caring for consumers once the purchase process is complete. At any point, if customers are dissatisfied with their mattresses, they can contact Nectar for a solution. During the trial period, the option to return the bed always applies. Afterward, the warranty covers many common issues and potential defects so consumers can rely on the bed year after year. What are the Parts of a Nectar Mattress? Each Nectar mattress uses high-quality materials, and each layer serves a specific purpose. Four special grade performance layers make up the base, including medical grade Certi-pur LUSH and Hi-CORE Foam. All together, the components combine to create a plushy 11-inch high sleep surface. Check out more about the Nectar mattress below. On top of each mattress, closest to your skin, is the Tencel cooling cover. The cover helps circulate air and wicks moisture away so that you don’t sleep sweaty. Each custom-milled cotton and Tencel cover breathes and protects your bed from dirt, too. The next layer of your Nectar bed is a quilted gel memory foam layer. Regardless of the firmness, you’ll notice the Nectar has a bouncier feel on top, and this layer is the reason why. Contouring gel is cooling and comfortable, but the quilting promotes better loft and comfort. Many brands shy away from quilted gel memory foam because it’s relatively expensive, but Nectar recognizes the quality of this construction method, as well as the comfort it offers consumers. Directly under the quilted gel layer is gel memory foam. The semi-open Lush Foam is a Nectar original and, as the company notes, it’s the most premium gel foam available. Typically, the medical industry uses the foam to absorb and distribute heat. 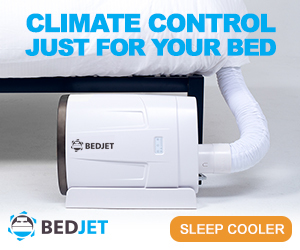 In your bed, that equates to exceptional cooling and responsiveness. Exceptional contouring and comfort can also mean pain relief for many sleepers, simply because the adaptive foam takes the pressure off pain points. Another layer of foam gives support and helps encourage deep recovery. Its density ensures rebound and bounce, meaning you won’t sink in. At the same time, the responsiveness provides excellent support for pressure points, contouring to your body for maximum comfort. The foundation of each Nectar mattress is stable yet breathable, with one of the highest density ratings possible in the industry. The density is part of what makes Nectar so confident in its beds that it offers the Forever Warranty. Plus, the base layer contributes to the edge support, a feature that helps prevent sagging of the bed and provides plenty of support no matter where you sleep on the mattress surface. Although other mattress companies tend to offer a range of firmness levels, Nectar has a single option. They call it “just right,” at a measure of around 5.5 to 7.5 on a scale of one to ten. Just right also means a medium firmness, which is desirable for most types of sleepers and comfort needs. Of course, the one-size approach may not work for all consumers, which is part of the beauty of the 365-night trial. Even if you tend to prefer a firmer mattress, it’s worth trying the Nectar for the potential comfort benefits, regardless of what your ideal firmness is. Plus, the bed works with all types of frames, from box springs to divan bases to traditional frames. You can also use a Nectar mattress with an adjustable base or a platform. The company also sells its own adjustable bases and foundations. According to Nectar, the mattress is ideal for all sleep positions. The dense interior foam keeps you from sinking in while the cushy foam layers keep you comfortable. Rather than dropping into a cloud, you’re suspended in it, which helps relieve pressure whether you sleep on your back, side, stomach, or all of the above throughout the night. Dealing with back problems? We've compiled a list of our best mattresses for back pain. CertiPUR-US is a third-party certification that ensures Nectar mattresses are free of known harmful chemicals and gases. With this certification, customers receive assurance that their beds do not contain Ozone depleters, PBDE flame retardants, heavy metals, formaldehyde, phthalates, or Volatile Organic Compounds. In short, Nectar’s mattresses are certified safe, so not only is your bed comfortable and cozy; it’s also guaranteed eco-friendly and safe. Although Nectar calls itself a bouncy mattress, the motion transfer is exceptionally low. Due to the stability of the premium foams and edge support, you will no longer feel your bedmate tossing and turning all night. The mattress absorbs the motion, dispersing it before it disturbs your sleep. How Much is a Nectar Mattress? Because Nectar only offers one type of mattress (and one firmness), the only price variation is due to mattress size. 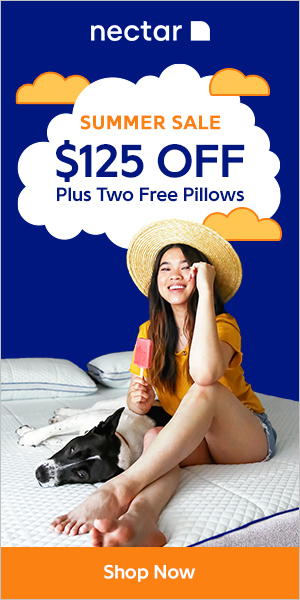 However, the company often runs promotions for discounts or bundles, including items like pillows in the package. Adjustable frames have features like a Zero Gravity setting for pressure reduction and improved circulation, USB plugs for easy device charging access, and built-in massage for relaxing vibrations. If you would like to have Nectar set up your mattress upon delivery, there is an extra fee required. The White Glove Service Option costs $149, and the service is the only way to have the company remove your existing mattress as well. You must pay the fee when ordering your bed. Where Can I Try a Nectar Mattress? Unlike many other mattresses for sale online, Nectar also offers its beds in-store at locations all over the United States. From their proprietary stores to partner stores, many customers can try out Nectar mattresses live in the store. Of course, there is also an extensive in-home trial period that can tell customers more about the Nectar sleep experience than any in-store test. Plus, the home trial option means you don’t need to worry about shipping and delivery costs, or bringing the bed home on your own because Nectar includes shipping with every purchase. As Nectar mattress reviews highlight, the trial period with this company is unsurpassed. You can enjoy an amazing 365 nights ‘trying out’ the mattress before making a final decision. Of course, most people don’t need that amount of time to determine they want to keep their Nectar forever, but if that’s the case, you also have a ‘forever’ warranty to go with it. Here’s more on the Nectar trial period and warranty. With Nectar, your trial does not begin the day the mattress arrives. Instead, there is a 30-day period in between before your 365-night trial begins. After that, the 365 days start, and you have an entire year to try it out. Should you decide to return the mattress at any point, the company will retrieve it. But it won’t just wind up in a landfill; Nectar does its best to donate unwanted mattresses locally. It’s not the consumer’s job to get rid of the bed—Nectar takes care of it all. The only non-refundable part of your trial is any White Glove delivery and setup service you ordered initially. White Glove fees are not refundable, but you will still receive a refund on the mattress itself. Otherwise, returns are free, and there is no cost to have the company come and retrieve your mattress, regardless of the reason for returning. You don’t need to keep any of the packing materials, nor do you need to pay a fee. Delivery charges do apply for international customers, but shipping and returns are free within the contiguous United States. Nectar offers an industry unmatched Forever Warranty. The guarantee covers the construction, materials, quality, and durability of your bed for as long as you own it. As far as negatives, the only drawback is the warranty is not transferable should you decide to sell your bed. One example of warranty coverage includes the company’s commitment to replace beds with impressions or compressions. Any indentation over 1.5” falls under the replacement policy, meaning you can receive a new bed if the original sustains damage. If you order White Glove service, Nectar’s delivery team will unpack and set up your new bed and any accessories. If you opt for standard shipping and delivery, which is free, the mattress will arrive in a compact box. Each mattress is compressed into its delivery box, so you only need to maneuver the box to where you plan to set it up, remove the cardboard, and then carefully open the plastic "shrink wrap." The mattress will then expand and take its regular shape. Within hours, your mattress will look fresh and new and be ready for a restful night of sleep. Nectar mattress reviews state that Nectar beds are a dream to sleep on, which isn’t really a surprise. The company backs its product up with lifetime support and guarantees, plus its trial period is unmatched. Nectar’s supreme confidence in its materials and construction methods also mean a great night’s sleep for consumers, so it’s an excellent investment with little risk. Nectar Sleep mattresses are a one-size-fits-all option for people who want a bouncy sleep surface with plenty of support and contouring. Of course, the limited firmness options will discourage some consumers, but overall, reviews on this bed are excellent, proving that one size sometimes does fit all when it comes to sleep comfort. Why Buy Your Next Mattress Online? Bed Tester is your ultimate resource for all of your sleep related needs. Whether you are mattress shopping, need a new pillow, or just want some info on how to sleep better, we’ve got you covered. We do all the research for you so that you don’t have to, and we deliver the best and latest information, to help you make the right choices about your sleep. Stay up to date on all the latest deals and innovations in sleep technology.